Most contractors in the home improvement industry rely on word of mouth to generate leads for their business. While word of mouth and other traditional business marketing techniques can still work they do not do so to the extent that internet marketing can work for a contractor business. This article presents some straight forward tips that can help contractors providing any type of service get more leads. When it comes to marketing contractor services one needs to step back and take a closer look at their business and what type of need their service offers. After understanding the service clearly, then an internet marketing campaign must be aligned with the specific business needs of the company. The first piece of advice is to forget about internet marketing for a second. The internet is great in providing the channel of communication, if the message is ineffective, then any effort online will miss the mark. Having a website is almost more important than having a business card these days. 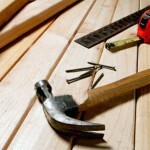 Even so, many small contractor businesses do not have a website. Having a website is important for several reasons. It is your online calling card. Given that prospects find it, they can find your contact information and get in touch. Having an online presence is important because it gives you the opportunity to be found. A properly put-together website can be a great selling tool. You can feature your offers or products and showcase examples of your previous work. Chances are that your business is not the only one offering the same services in your area. What makes you different? Offering lower prices is not necessarily something that will make you stand out. Aside from the fact that lower prices are not always associated with good quality services, there are many opportunities for differentiation that go beyond pricing. Service quality and professionalism can be communicated effectively. Also, consider personalizing your message. Your experience or special skills can speak volumes on who you are and what you can do. A good way for your business to stand out from the competition is to maintain a blog. Businesses that have a blog enjoy many benefits with the most important being that they get more leads. A well written and professional blog can help with enhancing your professional image, give your website a personal touch and boost your website’s rankings in search engines. Your prospects want to hire contractors who are good at what they do and are reliable. Aside from directly showcasing your experience, jobs and technical expertise, having a blog shows that you are confident about your skills, your services and are willing to openly communicate with your prospects. Also consider that while some prospects are searching directly for a contractor in their area, more prospects are searching for information about a problem they are looking for a solution for. Having a blog regularly updated with helpful information can attract much more traffic and potentially leads. The use of social media can generate leads for your business directly and indirectly. Creating and maintaining social media accounts on Facebook, Twitter, and LinkedIn, can help you connect with individuals who may not have otherwise been able to find you. You can leverage your existing network of friends to get in touch with new people who might at some point consider your services. You can use your profiles to showcase your services or promotions and thus capture the interest of your market directly. The effectiveness of such an approach really depends on the type of services you offer, and most importantly on what and how you communicate. Obviously the effect of such a campaign can be limited for small businesses that are operating locally. However the real value of using social media comes from its indirect benefits. Social media can also be used to generate demand for your services indirectly. Think of social media as a channel of communication. You can share, start and contributing to conversations, offer your expert opinion or take compliments and complaints immediately. A professionally crafted communications strategy on social media platforms can help increase your customer retention levels drastically. It also make things easier for your existing customers to refer your services to their circles. When a prospect finds you through social media, they will visit your website. Once on your website then you will have a chance of turning the visitor into a lead. To summarize, internet marketing for contractors can produce results if done properly. Whether you use social media or search engine optimization to promote your website depends on the goals you would like to achieve. The specifics of what combination of inbound marketing techniques would work best for your business depend on the specifics for your industry. A lead generation funnel for inbound marketing campaign for a pest control company would be much different than it would be for a landscaper or a roofing company. What internet marketing service mix would work best for a business varies.